Big Daves Day Off . 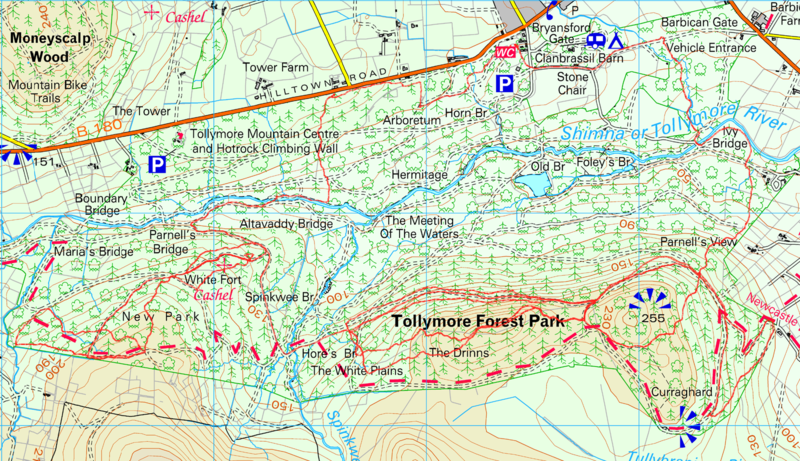 After some debate about where to start (no thanks to Mr Hull) we agreed in order to prevent a(nother) tantrum to start at Top car park Tollymore . Big Dave was to be guide along with ace cyclist Tomek Michalski (aka Tom ) . This left The Horse demoted to sweeper from his usual place at the head of the field but he took it in reasonable spirit . The Hound was sadly missed and our thoughts are with him as he struggles through a really bad tickly cough , get well soon Les . Rowan had a poor start with a mechanical and had to retire .The bike formerly known as ” the best bike in the world” is now lying in a heap on a hillside in Burren soon to be replaced with the next best bike in the world which he has been mumbling about anyway . 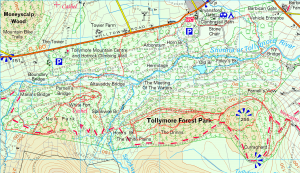 So many loops today with so many lovely if challenging trails ( ok challenging for an auld thing like me) .I cant describe them all but the route map covers it. Cormac managed an early comeback and the lack of appendix does not seem to have slowed him down ,I suspect he had something performance enhancing implanted in its place. Great turnout this am at the glen with plenty of tinsel and balls . Even some christmas lights on Teresas bike. Its a long time since we had 17 out , couple of Rossi diehards ,2 Wheelers although the wheel was very noisy! Fallow , Tunnel, Mast . Here Eamon forgot he was riding a mountain bike and broke into cyclocross mode carrying his bike to the mast , impressive but such hard work! JOD returned from the 6.1 secret training camp on his new secret weapon which I suspect was filled with Helium , not to mention the Cassette ring bigger than Jupiters rings . Mast to Knockshee , beautiful descent even if a bit moist .We clain the world record for the most Santas on Knockshee at any one time , I await confirmation from GBR . Back to Sallys Yard and across to post . Down fern gully where Cormac demonstrated a left hand power slide with twist and pike. Home by wall and Burma . Great Spin…Merry Christmas to all . Expect a low/ zero turnout xmas eve but back to normal following Sat . After last weeks big show of female talent ( in an MTB sense) , where were they today , even Molly didn’t show . Only herself showed up , must try harder girls. Paul had sent in a sick note however the committee decided that it was not acceptable. Maybe it was just as well as we had our exploring hats on. After climbing the long mile ,crossing to the ford and dropping to the Ulster way we headed for castle bog , stopping only to fail at fixing Rorys puncture . At the top we opted for a new descent to sheep pen along the fence . It was actually 90% rideable and I was impressed at the lack of complaints . Back home via Red Bog and home by ulster way , trails and wall. Quite an old school sort of day , relaxed pace , plenty of technical challenges and lots of mud .